I always enjoy going to the local worship services with partner staff when I am visiting Episcopal Relief & Development’s programs in other countries. It is a special opportunity to experience and be blessed by the varied gifts, music and perspectives on the Word of God in our Anglican family. One Sunday, I visited a Children’s Day service at the Anglican Cathedral in Ndola, Zambia. I knew that it would be lively because of the unique ways that children express themselves. I attended with my colleague Jellow Tembo, a Training Officer for our partner Zambia Anglican Outreach Programmes, and one of the founding program managers of our Early Childhood Development program which began in 2012. The service was similar to our Children’s Sundays here in the U.S.—the children sang songs, danced and recited scriptures. 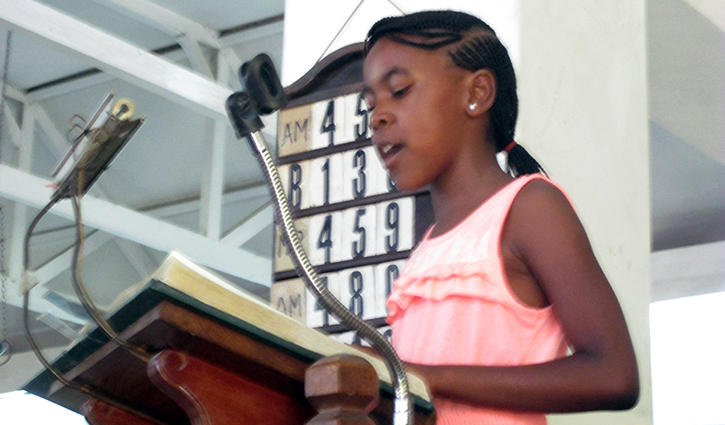 At only 12 years old, Walusungu’s remarkable self-confidence, poise and eloquent delivery were impressive. Yet even more so was how she inspired all of us in the congregation, as she quoted extensively from scripture to illustrate each point, painting a picture of how and why we as Christians are called to give. We should not give begrudgingly, out of obligation, excess or because it makes us feel good. Rather Walusungu reminded us that all we possess is from God. We are only giving back what we have first received. Thus, sharing our money, time and talent with the church and our neighbors is a portion of our praise and thanksgiving to God, to be offered freely and joyfully. On the journey through the season of Lent, I’m still reflecting on this way of giving. Let’s pray that Episcopal Relief & Development, its partners and program communities will continue to be led by children, like awe-inspiring Walusungu, on the path toward an abundant future. God of Compassion, who watches over your children like a mother hen gathers her brood: Uplift those who care for and protect the youngest and most vulnerable among us, so that all children might be nourished, nurtured and given the tools they need to thrive and become healthy and whole adults; in the name of your well-beloved son, Jesus Christ. Amen. Dawn Murdock is the Director of Strategic Learning and Program Resources at Episcopal Relief & Development.